I guess an alternative title for our rundown could be ‘great things from unlikely places’ and there is arguably no more unlikely place than The Osmonds. Another band with their own TV show ( see also the Monkees at Number 7), where the hell (sorry heck) did this one come from? Number 2 in 1972 apparently it is a treatise on car pollution. Thanks to Mike in Brisbane for reminding me of this one. 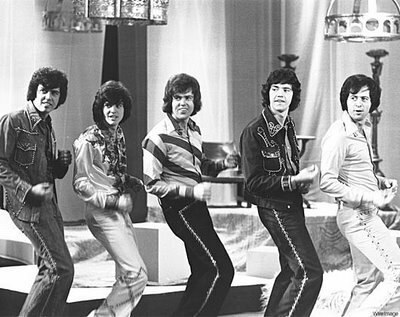 Who knew that Donny was such a whiz with the theramin…..
Who can forget those crazy, crazy, Osmond dudes, their polygamous religion and impossibly gleaming all-american teeth (later adopted as fashion statement by Nick Heyward). Bearded and permed middle of the road, middle-class white boys with beards and perms attempting a reggae tune with neo-colonial lyrics ? Or whip-smart art-pop rockers making a knowing statement about the stupidity of rich western tourism to poor countries ? Or just a summer tune about cricket ? Well Dreadlock Holiday is just annoying because I was about to post ‘I’m Not In Love’ next, so back to the drawing board on that one. The second one is just quiff- tastic. I think I saw the Stray Cats supporting U2 at Milton Keynes Bowl, but it could have been Spear Of Destiny, I was a long way from the stage…. Love ‘Runaway Boys’ – I’m also a bit partial to ‘Stray Cat Strut’. You can’t beat an upright-bass and a quiff. Brian Setzer now fronts the Brian Setzer orchestra, a 21st century swing revival band which also does Stray Cats covers – well worth checking out (particularly their Christmas album ). By complete contrast,Slim Jim Phantom plays drums in a band with Lemmy called Head Cat ! We are agreeing far more than I thought we would. Nothing wrong with that, but perhaps tomorrow will be ‘controversy day’. Although I am not sure if it is possible to get more controversial than Careless Whisper. Dare I post Don Estelle and Windsor Davies…? George Michael, Donny Osmond or Girls Aloud ? Its a difficult call as given the opportunity and unlimited funds to prevent them ever escaping, who you would choose to leave first on a desert island with only a Slayer album for company. Anybody beats me to posting Keith Harris and Orville tomorrow, there will be trouble.